When FileVault was born in 2001, we asked records managers how they felt about their record storage or RIM (records and information management) strategy: 100% either were too anxious to respond (and those were the days BEFORE major legislation like Sarbanes-Oxley, FACTA, and the like), or they were very upset with their vendor. The best team in the business communicates with our clients clearly and frequently. Best-in-class systems control our operations, eliminating discretion and allowing us to guarantee results. Our team and our systems outperform every day – just ask any of our clients. We know that you are concerned about your records storage, corporate information security, accessibility, workflow, and compliance. You may also have space concerns. Our records management program is set up to relive these concerns efficiently and effectively, irrespective of the quantity of files or the type of media, whether paper, fiche, magnetic – or tissue samples. Filevault is an Off Site Storage & Data Backup facility. 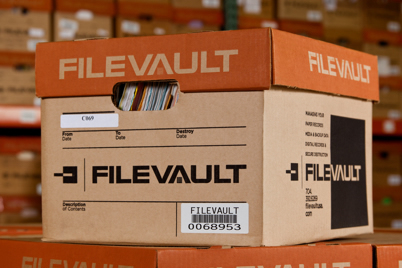 We store records for Medical, Law, Banking & Financial, Real Estate, Insurance Agencies and much more.